Phillip Torrone posted in his Soapbox column yesterday: 'My Top 10 Favorite Arduino-Compatible “Clones” and Derivatives' with examples showing the broad spectrum of board variants. All of the mentioned boards (except for the Menta) were already on my spreadsheet, and after commenting with a link, I've been inundated with emails suggesting other boards to add-- wonderful!! Femtoduino: Fabio Varesano's tiny 328-based board with .05" pin pitch. Menta by Adafruit fits in an Altoids tin, has a prototyping area and is shield-compatible! Minuino is another fine Spikenzie Labs Arduino-compatible board with as few components as possible and the smallest footprint to accommodate shields. ReaDIYmate is a Kickstarter project which Seeed is pre-selling, including WiFi, MP3 decoding, a MicroSD slot, and audio amplifier... wow! BUT: the Kickstarter isn't funded yet! Go support this cool board!! Suggested boards I'll look into: AllgaierShops Breadboard Adapter (BYO ATmega), SMDuino (design only), MHVBoard (also design only), two boards from Ro-Bot-X Designs, JeeNode Micro, and maybe Akafuino X and a few other xmega boards which are not strictly Arduino-compatible (yet?). The Nanode project from (the?) London Hackspace has been on my radar but didn't make the spreadsheet since I was waiting for it to become available. Well, it's out ($40 kit), and it seems to be a hit! Unlike the Arduino Ethernet and shield and other boards with built-in ethernet, the Nanode does not use the Wiznet W5100, instead using the Microchip ENC28J60 found in JeeLabs EtherCard, and you can even program it over ethernet! There's finally an official Arduino Ethernet ($60), complete with RJ45 port. It has an FTDI cable header for programming (no USB), a microSD card slot for storage, and there's an optional PoE daughter card. 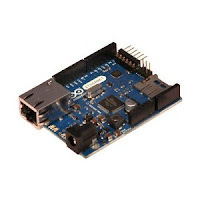 SparkFun also released an Arduino-compatible board with ethernet, the Ethernet Pro ($55), but without the SD card slot. It's less cluttered than the official board, hopefully the price will come down as more people build projects around them. Additionally, the Freetronics EtherTen ($70) includes a microSD slot and (mini) USB interface. All of these are compatible with an Arduino (or Arduino-compatible) board with the ethernet shield ($40) on top, but I wonder: will shields fit on any of these without hitting the magjack? Or do they use taller female pin sockets? They're also equivalent to an Arduino hooked up to a Wiznet W5100, eg. with a WIZ811MJ module ($20!). Too bad Adafruit doesn't sell the ethernet module breakout shield anymore, but at least the design files are still available. Call me cheap, but these all seem overpriced, being based around a $4 microcontroller! With a basic Arduino board at $20 and WIZ811MJ module at $20, why isn't the SparkFun Ethernet Pro $40 or $45? I've continued to add Arduino-compatible boards to the spreadsheet, bringing the count to 119 boards. You can get there easily by remembering "allarduinos" and going to http://tinyurl.com/allarduinos or http://bit.ly/allarduinos. Wise Clock 3 with a 32x16 Red-Green LED display (from Sure Electronics) has many different modes, including Pac Man, game of life, Pong, and... make your own! ClockTHREE Junior (aka C3Jr), a collaboration with WyoLum, which is similar to the QlockTWO readable clock. DWex, "Duino Watch for experimenters"-- chock full of SMD LED goodness; this actually came out last year but I missed it. 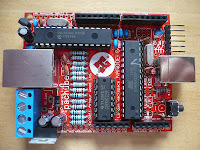 From SparkFun comes the PTH (plated through-hole) Kit, very similar to Diavolino and my Minimalduino, but surprisingly priced at $30. It doesn't seem up to SparkFun's high standards though, since there is no power switch and the electrolytic capacitors are too tall, so shields won't fit. So many people have asked for a column on the Arduino-compatible board spreadsheet showing the date when each board was added, so I put that on the spreadsheet this week. I had to sift through the revisions, but it wasn't too much of a pain. Six boards by the Indian company Bhasha, all through-hole except for the FTDI USB chips, mostly simple designs but it's clear from the traces that the boards were reworked slightly. Interesting to see the "Severino" Single Sided Serial V3 design offered for sale, something I haven't seen elsewhere. 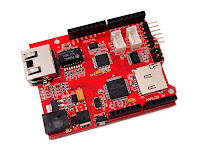 Zigduino by Logos Electromechanical is offering their first run of IEEE 802.15.4 radio-equipped boards for $70. I've been looking forward to these boards coming out, but the price seems high given that you could buy an Arduino FIO for $25 and an XBee module for $19, so $44 total, or a Freakduino Chibi for $33. I hope the high price is only for this first run and that it is lower when Logos goes into full scale production, but I also wonder if it's as easy to use as the widely available XBee modules for which there are many example sketches available. It does have XBee "Pro" capabilities though, and I'm not familiar enough with 802.15.4 to really compare it to other offerings. I look forward to more complete documentation on its specs along with full design files since it's unclear what its equipment and capabilities are. I've made some changes to my Arduino-compatible boards spreadsheet lately: I added a few boards, removed boards which are no longer available, and made some general changes. Stripduino by TinkerAct! 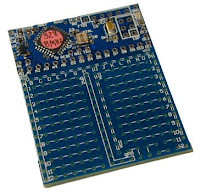 has a small SMD area for its Arduino-compatible core, with IO pins in a line next to a stripboard area for on-board prototyping. There was an initial issue with the name of the board, but it seems straightened out now, and the design is lovely-- nothing extraneous. It reminds me of one of my favorite boards, Prototino by Spikenzie Labs. "Drum Kit - Kit AI" by SpikenzieLabs, a "maybe not" Arduino-compatible board for creating a MIDI 6-pad drum kit using piezo sensors stuck to just about anything. 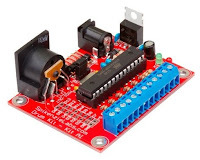 rEDI Education Board by Rogue Robotics is a prototyping board with buttons, LED's, a piezo speaker and volume knob, real time clock, high-powered 5V voltage regulator, servo headers, and a breadboard area. Also "maybe not" Arduino-compatible since it runs an ATmega644P, so it needs a custom bootloader. A bunch of boards by Fundamental Logic which apparently stopped accepting orders in May of 2010. That makes me sad since they offered some interesting boards, but thankfully the designs are still online for reference. My favorites: iDuino, StickDuino, MPGuino. Modified Pico was a very compact, breadboard-friendly Duemilanove-compatible board. Thankfully details (including design files) are still available. Rampage Robot Base V4 was an Arduino-powered robot platform with headers for a shield. Looks like its creator has moved on to more complex microcontrollers. Zuccherino by Evil Mad Scientist Laboratories was to be "a low-cost, scalable, and extremely versatile open-source motion control platform," but the project has not had an update in a while. I look forward to more from this project. "Flexi" was an inexpensive breadboard-friendly clone, not sure what happened but the domain now hosts a useless/spammy link page. I just added a "By" column for designer, author or manufacturer. I'd like it to be simply "Author," but some companies [cough] mostly sell other peoples' designs, so I'm not sure whom to credit. I'd like to add more information about when boards were edited or checked, but wading through the revision history in Google Docs is a pain. A few people have suggested this and I like the idea, but I can't figure out how to track down the details. I updated a bunch of boards' links, prices, and chip; a few use ATmega328s but used to be ATmega168s. As always, please email me with any suggestions or corrections!